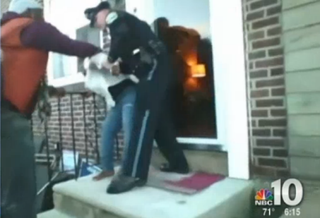 Michael Gaymon begs a police officer not to arrest his daughter, Sanshuray Purnell, in Collingdale, Pa., Feb. 22. Three Collingdale, Pa., police officers are facing a lawsuit accusing them of unlawful arrest, malicious prosecution, retaliatory arrest and unlawful search after barging into a home to confiscate a cellphone that was being used to record one officer’s aggressive questioning, NBC 10 reports. Michael and Kia Gaymon, 35 and 38 years old respectively, also included the borough of Collingdale in the lawsuit. According to the report, it started with a neighbor calling the police after Michael Gaymon’s mother came for a visit and partially parked her car on the neighbor’s curb Feb. 22. Three officers arrived, and one officer allegedly began to yell at the husband and wife in an “aggressive and accusatory manner” and accused them of spitting on their neighbor. The couple told the officer that was a false accusation. “His behavior was so aggressive that the first thing I thought was to pull out my phone and video,” Kia Gaymon told News 10. According to Kia, the officer came within inches of her husband’s face and screamed at him. So she started to record as she stood outside the front door with her cellphone. It was then the officer noticed her and told her to stop. “He told me that if I continued to video, he was going to come in my house and confiscate my phone and place me under arrest,” Kia Gaymon told the news station. The officer allegedly claimed, the lawsuit notes, that it was illegal to record him. However, the family, along with the couple’s 21-year-old daughter, Sanshuray Purnell, told him he was wrong and it was their right to record him. The officer then told Kia Gaymon that he would enter her house and confiscate the phone and arrest her if she did not stop. When she refused to comply, the officer allegedly made good on his threat, handcuffing the couple’s daughter and threatening to use a Taser on her. After another officer took Purnell away, the officer who had handcuffed Purnell allegedly entered the family’s home, even as they asked him to leave, and grabbed Kia Gaymon, allegedly putting his Taser to her chest, the lawsuit claimed. She, too, was arrested. She and her daughter were given citations for disorderly conduct. Cellphone footage taken of the arrests shows the Gaymons’ 10-year-old son screaming and crying as the police take his mother and sister away. In May charges against the mother and daughter were dismissed. Read more at NBC 10.